Carnegie Nomination for Lockwood & Co! The nomination list for the Carnegie Medal 2019, the most prestigious children’s literature award in the UK, was announced this winter – and it included Lockwood & Co.: The Empty Grave! Lockwood features alongside tens of other amazing novels – congratulations to all the authors and illustrators chosen! Jonathan has had a busy few months recording two video interviews where he talks about his writing, characters and where he gets his ideas. This spring the second Freedom To Think podcast went live – this time featuring Jonathan chatting with award-winning author SF Said. Jonathan is busy writing and working on a new project this spring, but he has taken some breaks from his office to meet his readers and fans! 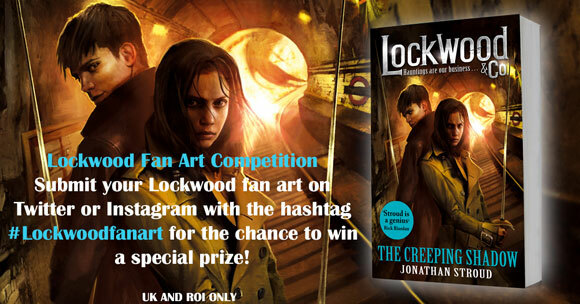 There are some amazing artists and scribblers creating fan art inspired by Lockwood & Co! If you have a spare moment and want to check out how other people imagine Lockwood’s world, search the hashtag #Lockwoodart on twitter. Glowing reviews continue to stream in for the fifth and final Lockwood & Co. installment. The Empty Grave’s rating on GoodReads stands at a mind-blowingly brilliant 4.6 out of 5, calculated from over 3000 reader ratings! News from 2018 . . .
Jonathan is a Patron of Reading! This spring, Jonathan Stroud has been appointed as Beechwood Park School's first ever Patron of Reading. The role will see Jonathan undertaking activities throughout the calendar year of 2018 including author talks, creative writing workshops, judging writing competitions, suggesting reading lists, presenting awards to Year 6 pupils at the school's summer Booker Prize Awards ceremony and more. "We are delighted that Jonathan has agreed to take this position, and are looking forward to working with him as our Patron of Reading throughout 2018." “I’m truly thrilled to be Beechwood Park’s first ever Patron of Reading. Books are a vital part of every childhood – for the doors they open, for the worlds they unlock, for the new dreams and possibilities contained on every page. They send the imagination soaring and they help us forge an understanding of who we are. A Patron of Reading is a school's special children's author, poet, storyteller or illustrator. The school and their patron develop a relationship over a period of time. Everything the patron does is related to helping encourage and develop a reading for pleasure culture in the school: book quizzes, blogs, book recommendations, discussions, plays, poetry bashes, blogs, book trailers and visits. The possibilities are virtually endless. One of the best things about being an author for Jonathan is seeing his readers enjoying his worlds and characters so much that they create their own content inspired by his stories. From the plethora of amazing fan art based around Lockwood (google Lockwood fan art) to a new fanzine and podcast, it’s thrilling for Jonathan to see his work explored and admired by his readers. News from 2017 . . .
Jonathan is going to do one more big schools event in November to round off the tour for the 10th anniversary of the Swindon Youth Festival of Literature. Click here for more details. Jonathan was interviewed via the internet for a‘15 Minutes With…’ slot for Booktrib in the US via Net Galley. TV Deal Announced for Lockwood & Co! Today, it has been announced that Big Talk Productions have signed a deal to adapt Lockwood & Co. for television. Big Talk’s credits include feature film, Baby Driver, and, currently in production, Joe Cornish’s new movie; The Kid Who Would Be King, for 20th Century Fox. For TV, Big Talk have made Cold Feet (ITV), Rev (BBC) & Friday Night Dinner (Channel 4). THE EMPTY GRAVE publishes this week in the UK so the announcement is great timing. First Reviews of The Empty Grave! Covers for The Empty Grave revealed! 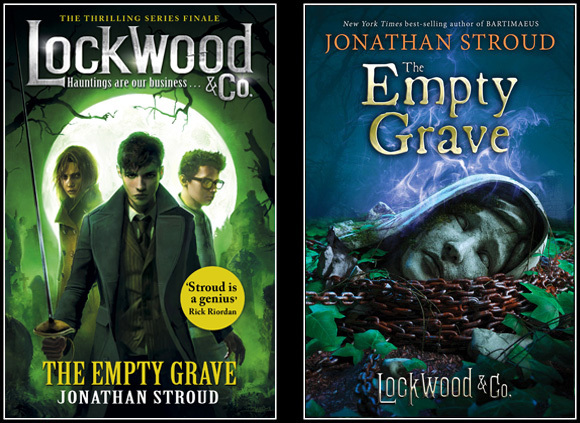 The fifth and final installment in the Lockwood & Co series, The Empty Grave, will be coming out in September 2017. To whet your appetite, Jonathan has shared the American and British covers for the book, which look fantastic! The UK jacket (below, left) features George for the first time, which has pleased many of Jonathan’s fans, and the US jacket (below, right) continues the series look of an object relevant to the story looking as creepy as possible. The latest installment of Lockwood & Co continues to receive glowing reviews. The Creeping Shadow was nominated for a Good Reads Choice Award in the middle grade category. The Screaming Staircase is up for the Leicester reading Rampage Award. The winner will be announced at a ceremony in June this year. The Hollow Boy scooped the top prize of an Indonesian awards - the Paranormal & Supernatural Fiction awards. Meanwhile, the Swedish audio book for The Hollow Boy has been nominated for the Stora ljudbokspriset award (loosely translated to Great Audio Book Award). 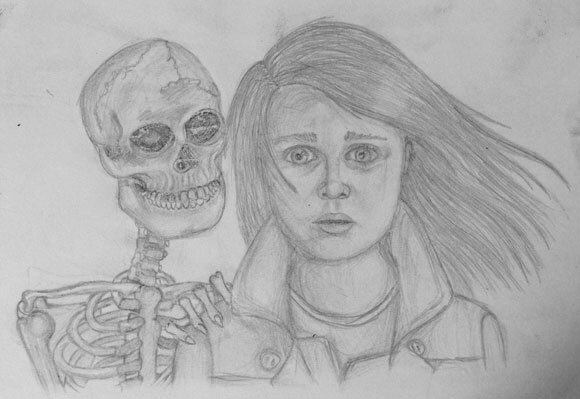 The winner of the Lockwood fan art competition is this brilliant pencil drawing of Lucy and a very creepy skeleton. Congratulations to the artist, Connie Turner. The first reviews of the new Lockwood & Co installment are coming out in the media and blogosphere – and they’re glowing with praise! This month Jonathan will release an extract from The Creeping Shadow, the fourth Lockwood & Co. book. You may remember the cliffhanger ending of The Hollow Boy, and be desperate to know what happens next. Well, the wait it almost over - you can read the first chapter of the new book from Thursday 14th July at 5pm UK time. There will be a link to it from that time on The Creeping Shadow page. In June, Jonathan revealed the UK cover of The Creeping Shadow to the world, with a fantastic reaction. He followed the reveal with a facebook live chat, which is always a fantastic chance for him to connect with his readers and fans across the globe. More Awards for Lockwood & Co! This spring, The Screaming Staircase was awarded a top literary prize in France - the Prix Chimère 2016. Lockwood won the prize in the 11-14 years category. The Prix Chimère recognizes and awards books in the ‘imaginative’ genre so that might be sci-fi, fantasy, horror, or in the case of Lockwood, a mixture of all three. The prize is organised by school librarians from all over France, and the winners are chosen by a voting group of young people and teenagers. 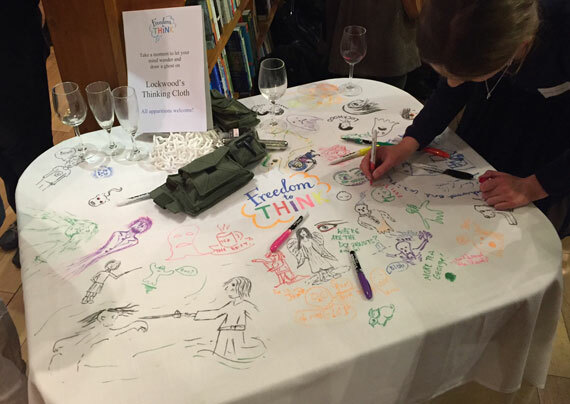 In April, the Oxford Literary Festival hosted the first ever Freedom To Think event all about creativity. It was called THE GREAT BRITISH CREATIVE CHALLENGE! Jonathan chaired a talented panel including Abi Elphinstone, Alex Wheatle and Chris Riddell. The panel discussed their creative roots as children, how they developed their artistic passions in to careers, and how they carve out space now to explore their imaginations. There was also a hilarious live creative challenge where the audience shouted out items and creatures for the panellists to draw - Chris and Alex conjured up a burrito-wearing cutlery fish, and Alex and Jonathan designed a werewolf going to a party. The event was proudly support by children’s newspaper, First News, which backs the campaign’s concept and, via the paper’s stories, quizzes, competitors and more, it encourages children to explore and enjoy their creativity. Reviews for The Hollow Boy! “I love this series so much, the characters are funny, the plot intertwines everything neatly so we see both character development and action sequences, and the ghosts are awesome. I can't wait to see what happens next, there was something of a shocking ending and I need to know how things work out! Join Lockwood & Co for live, online murder mystery game! If you haven’t yet taken part in a Lockwood Whodunit, you’ve missed out. Every Friday 13th this year, a game is being run asking fans and readers to join Lockwood’s psychic detection agency to solve a case. The third Lockwood Whodunit will take place this month, on Friday 13th November, and it promises to be the hardest case to crack so far. Fans of Jonathan’s books and readers from all over the planet are invited to take part in the game. All you have to do is follow the clues throughout the day and piece the evidence together, to discover the haunting, the source and the story behind the paranormal goings on. It is your chance to discover what life is really like for the ghost hunters in Lockwood’s London. Another Starred Review for The Hollow Boy! Lockwood, Lucy and George must be jumping for joy in Portland Row this week as the story of their adventures receives more critical acclaim. In thrilling news this week, Lockwood has been nominated for one of the most prestigious British literary awards – the Carnegie Medal. The Whispering Skull is on the nomination list, voted for by UK librarians, alongside the crème de la crème of the British publishing world. Congratulations to Jonathan (and Lockwood, Lucy and George of course!). Latest reviews for The Hollow Boy! On top of reviews of The Hollow Boy, Jonathan’s name has come up elsewhere on the internet this month. A mention for Lockwood & Co. on Den of Geek this week, in an article about books being developed into films. No new updates on the Lockwood film just yet, but nice to see it amongst this list. Two great bits of news just in for our ghost-hunting trio - The Whispering Skull has been longlisted for the prestigious UKLA book awards. These British awards are the only national awards judged entirely by teachers and the longlist includes the crème de la crème of the authorial world. The Hollow Boy launches in the UK! The end of September saw publication of The Hollow Boy in the UK to a fanfare of applause, virtual and actual, from fans and readers. Jonathan did a fan Q&A on GoodReads on publication day (see his answers here), the first (and very positive) reviews came in (see below), a funny article about characters’ clothing by Jonathan went live on the Waterstones.com website (visit the page here) and Jonathan held a launch event in London. The launch party was held in Daunt Bookshop in Chelsea and a wonderful crowd of booksellers, librarians, teachers, book bloggers, reviewers, readers and more came out to celebrate the new adventure of Lockwood & Co. Guests played a ‘guess where the ghost is’ map game and let their creativity loose on Lockwood’s ‘Thinking Cloth’. Jonathan also took the chance to speak about his new creativity campaign, Freedom To Think, which hopes to see children given more time to be creative and use their imaginations. Last month Jonathan travelled thousands of miles around the US talking about The Hollow Boy, meeting readers and signing books for fans. The tour was the first time Jonathan’s been paired up throughout with another author; he and Eoin Colfer did every event together and got on like a house on fire (that means really well for anyone who doesn’t know that very English saying!). The first reactions to the third Lockwood & Co. installment are in and they are glowing with praise! Booklist, a well respected book review magazine in the US, awarded The Hollow Boy a starred review saying: “From the banter among the young associates at Lockwood & Co. and the flaring of unruly emotions to the well-choreographed fight scenes involving monstrous spirits, Stroud brings his considerable storytelling skills to bear in this riveting sequel to The Screaming Staircase (2013) and The Whispering Skull (2014)”. 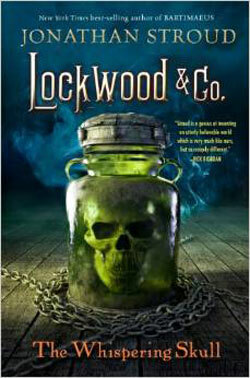 Details about the third title in Lockwood & Co. series revealed! This summer the first details about the next installment of Lockwood & Co have been released. The book will be called The Hollow Boy and it will be published in America on 15th September, the UK on 24th September, and Germany on 26th October. Other international editions will be published thereafter. To support the global publication of The Hollow Boy, Jonathan will be spending the autumn touring, meeting fans face-to-face and online via social media. Confirmed so far is a publication tour of America with Disney Hyperion in late September, a UK events tour in October and November, a Friday 13th (November) online detective game called #LockwoodWhoDunIt run by Jonathan’s UK publisher, Penguin Random House, and more to be firmed up too. Jonathan Stroud launches Freedom To Think Campaign! This summer, Jonathan Stroud is launching a campaign close to his heart – it’s called Freedom To Think and its aim is to help children unleash their imagination through regular, dedicated, creative ‘free time’. Freedom To Think suggests parents and carers ring-fence at least one period each week for their child as unstructured thinking time. Within this period, it’s up the child to choose their activity and to direct their play. The campaign will provide a space online for parents and children to capture their creative moments, and it will offer inspiration via monthly activity ideas. Jonathan continues: “I think all parents would agree that play is an invaluable part of their children’s lives. Crucially and above all, of course, it’s about having fun. But it does other things too. Through play kids learn to be creative – they make things, they improvise, they follow the implications of their own ideas. And it gives them better self-knowledge, helping them to understand the world and their own place in it. In short, it’s an essential part of their personal development. Jonathan will be supporting and promoting the Freedom To Think campaign alongside his work as an author. The Lockwood & Co. books have received more literary accolades this summer, much to Jonathan’s delight! The Screaming Staircase has won the Hampshire Book Award, voted for by young people aged 11-13 from 50 secondary schools in the county. There will be a ceremony held in the autumn for Jonathan to collect the award in person. The audio book version of The Whispering Skull has been named a YALSA Amazing Audiobook! The judges of the award commented “The spine-tingling performance of Lyons’ narration will keep listeners on the edge of their seat.” It’s a double triumph for Lockwood - The Screaming Staircase audio book also made the list in 2014. Sherlock Holmes inspires Lockwood & Co. The Guardian (UK) published an article by Jonathan earlier this year about his lifelong admiration for Sir Arthur Conan-Doyle’s famous detective, Sherlock Holmes. Jonathan explains that his early love for detective stories, and specifically Holmes, directly fed in to the inspiration for Lockwood & Co. The Dagger in the Desk publishes! The Lockwood & Co. short story, The Dagger in the Desk, has been published as an ebook, complete with the story itself and an illustrated guide to the ghosts and ghouls found in Lockwood’s London. Jonathan wrote the short story in 2013 in conjunction with the Guardian’s website – it was an innovative project that saw the story created interactively with young readers in the UK. The children chose the setting, the title, the ghost and the jokes. Every day Jonathan would log on and write the next installment based on the children’s votes and suggestions. At only 49p it’s an irresistible download – either for readers who are yet to discover Lockwood’s world and want to try it, or for committed fans who are looking for more adventures, laughs and scares from our favourite ghost hunting trio. At the start of the year, the category winners for the Costa Book Awards 2015 were announced, including the winner of the children’s category as judged by Jonathan. Kate Saunders’ Five Children on the Western Front scooped the win for the kids prize. Since the category announcements, Jonathan has been furiously reading other category winners as he was invited to join the judging panel for the overall Costa Book of the Year award. The winner is announced this week at a ceremony in central London which Jonathan will attend. Watch this space for the judges’ best book of the year. You maybe remember, in 2013 Jonathan teamed up with the Guardian to write an online, interactive Lockwood story for Halloween where the readers took control of the story. It was an incredible week: kids inventing ghosts they’d like included, choosing where the story was set, what strange and funny events took place. Every day Jonathan would log on and write the next installment based on the children’s votes and suggestions. 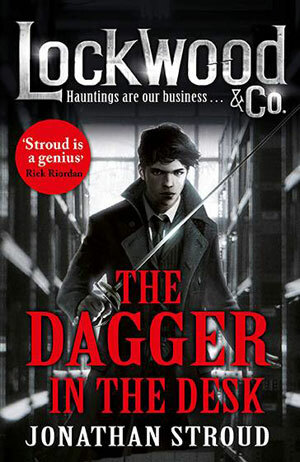 The result was the short story, Lockwood & Co: The Dagger in the Desk. It is hugely exciting to announce that this story will be published as an e-short by Hyperion in the US and by Penguin Random House in the UK on 9th February 2015. The e-short also includes illustrations and descriptions of the various types of ghosts in Lockwood’s world. If you have a spare half an hour, do download it and read it over a cuppa – a little extra Lockwood to add to your day! The category winners of the Costa Books Awards 2014 have been announced, including the best children’s book, which was co-judged by Jonathan. Congratulations to all the winners – and the judges too of course! The national newspapers have been selecting their best books for Christmas and their top reads of 2014 – and lots of them have included Lockwood! Another blog, Books, Literature and Writing, run by Madelyn, reviews The Screaming Staircase and includes a wonderful ‘which character from Lockwood & Co are you’ quiz – we highly recommend it! “A page-turner at its peak, Jonathan Stroud has written another rip-roaring success of a story that has all the chills and thrills of the first book and the added depth of characters and their relationships that build over time and develop” raves Sister Spooky blog. “The Whispering Skull 100% delivered a steaming hot and delicious pizza pie of satisfied high hopes” says Book Punks blog. “The Whispering Skull is an impressive addition to the Lockwood & Co. series, expertly managing to avoid the infamous sequel slump while simultaneously laying the groundwork for what promises to be another exciting adventure. The next book cannot be released too soon.” writes Pages Unbound blog. “Jonathan Stroud is a genius for plotting” says Sonder Books blog. There was also a Guardian competition for young fans to invent their own ghost and be in with the chance of having their ghost appear in the third Lockwood book! The Social Potato took readers in to Jonathan’s life as an author through a photo tour of his office! As you may know, Jonathan is a judge of this year’s Costa Book Award in the children’s category. This month he met with his fellow judges; literary consultant, Jake Hope, and book critic, Lorna Bradbury, to debate the shortlist. Their choices were announced on Radio 4’s Front Row this week. More award shortlistings this month as the list for the Warwickshire Secondary Book Awards is announced and The Screaming Staircase has made the cut! Students in years 8 and 9 all over Warwickshire will now be reading the shortlisted books and voting for their winner, which will be announced at a ceremony in March 2015. Fingers crossed for a Lockwood triumph! Also don’t miss Stephen’s hilarious application letter to Jonathan within the review! Award news: The Screaming Staircase has won a category in the Book Blogger UKYA Awards this week! All book bloggers in the UK were invited to choose their favourite books and authors in a variety of categories and, to great whoops of joy in the Stroud household, Lockwood came out on top in the paranormal novel category. The bloggers, who give up their free time to review and recommend books in the UK, are a special bunch of people - passionate, knowledgeable, discerning, magnanimous – this win really is a great honour. For the full list of winners see the post on A Daydreamer’s Thoughts blog below or follow the conversation on twitter at #bbukyaawards. Award news just in – The Salford Children’s Book Award has shortlisted The Screaming Staircase in their 2015 award! Lockwood will now battle it out against the other five shortlisted titles as students from 18 schools in and around Salford will vote for the winning book - to be announced at a ceremony held in March next year. The Sunday Times has put together a list of its favourite ‘100 Modern Children’s Classics’ (chosen from the past 10 years) and it’s thrilling to see Jonathan’s stand-alone 2009 novel, Heroes of the Valley, has made the selection! Jonathan has done a Q&A for American entertainment news site, Hypable, to celebrate publication of The Whispering Skull in the US. A few months ago, Lockwood & Co.: The Screaming Staircase was longlisted for an Inky Award, a prize presented by the Centre for Youth Literature at the State Library of Victoria, Australia. This week, the shortlist was announced at the Melbourne Writer’s Festival and Lockwood has, thrillingly, made the list! The winner will be chosen by votes from young readers and the most popular book will be announced at a ceremony on 21st October. Keeping our rapiers crossed for Lockwood. More boosts for Lockwood’s ego! The Screaming Staircase has been shortlisted for the Coventry Inspiration Book Awards 2015! In its ninth year, this regional literary prize is voted for by young people in the UK and, more recently, now takes votes and feedback from readers around the globe. Fingers crossed for Lockwood when the winner is announced in spring 2015. Lockwood’s first installment is also shortlisted for The Weald Book Award 2015, a Sussex literary prize voted for by young people from seven local schools. The winner of the award will be announced in March 2015 at a presentation attended by the shortlisted authors (rapiers at the ready!). Also up for glory in the US, The Screaming Staircase has been chosen as one of 20 books to compete in the St Louis, MO, annual book battle. This sees 20 books go head-to-head with over 30 teams of middle-school students reading the books, voting and being tested on them. Jonathan will take part in the battle by contributing a blog entry later in the year. There have been two sci-fi/fantasy conventions going on in the UK this month, Nineworlds and London Comic Con. Although Jonathan wasn’t in attendance, his physic detective agency didn’t miss the chance for self-promotion (!) 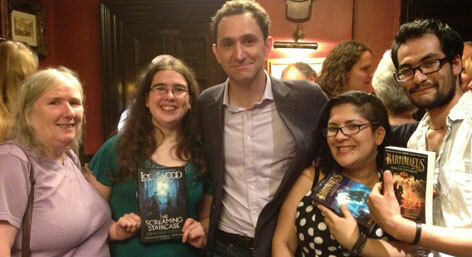 - postcards and Lockwood goodies were up for grabs for fans who attended. Countdown to The Whispering Skull begins! The chance to get your hands on The Whispering Skull is almost here! With just over a month to go, buzz is building and the first copies have arrived hot-off-the-press. Watch this space for reviews, giveaways, event images and more as the next step in Lockwood & Co’s adventure unfolds. Click the covers below to pre-order The Whispering Skull at Amazon in the UK and US. First reviews of The Whispering Skull! “An occult portal and its spectral guardian nearly cut short the careers of three rising young ghost hunters in this madcap sequel to The ScreamingStaircase (2013). Continuing their predilection for falling into predicaments that require rapier work and fast exits, psychic detection agents Lockwood, George and Lucy are reluctantly hired by Scotland Yard to track down a mystical old "bone-glass" no sooner found in the arms of a moldering exhumed corpse than stolen. As everyone who has looked into this small but potent artifact seems to have either been driven insane or eaten by rats (or both), police and psychic black marketeers are equally eager to get their hands on it. 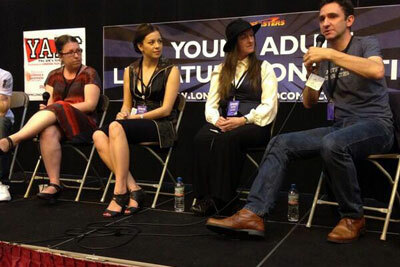 Last weekend London was host to the first ever convention for Young Adult fiction in the UK. Held as an off shoot of the London Film and Comic Con at the Excel Centre in Earls Court and curated by Children’s Laureate, Malorie Blackman, YALC saw a coming together of the crème de la crème of the YA authoring world. Jonathan took part in a panel event called ‘Bring Me My Dragons’ – the event was packed with readers of all ages who had some insightful and interesting questions, and the signing queue afterwards snaked through the convention. A wonderful event and everyone’s keeping their fingers crossed for YALC to become an annual event. The Screaming Staircase is Waterstones Children’s Book of the Month! July is such an exciting time, the paperback of The Screaming Staircase is publishing all over the world and in the UK it’s been chosen as top booksellers Waterstones’ book of the month for children. As part of this major promotion, a bookseller from Waterstones Durham (Darran Stobbart) has written a blog about Lockwood & Co for the Waterstones website. Darren says: "a series to capture the imaginations of children, hooking them on to reading". And Jonathan’s written a very funny guide to writing ghost stories – a must read this one! 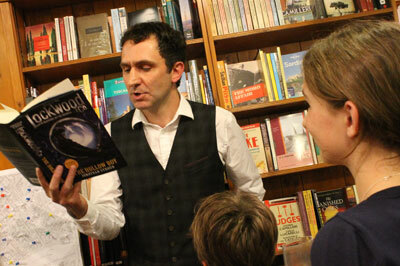 Jonathan has been on the road this month to support the Waterstones promotion. He’s taken the heady Lockwood mix of danger, spookiness, action and humour to schools around the south east of England in conjunction with several branches of the book store (Bedford, St Albans, Milton Keyes, Ipswich, Bury St Edmunds). Jonathan also popped in to branches to sign books in Berkhamsted, Richmond and Teddington, so if you live nearby do pop in as they’ve got signed copies. Twitter abuzz with Lockwood fans! Thrilling news just in: Lockwood has won a literary award in Austria – in fact, it’s won two! The Screaming Staircase was voted the best book in the Austrian Young Critics award in two different age categories – a first for this award! Jonathan’s novel has won the 12 year old age category and the 14/15 year old category too – a double win! Jonathan has actually won this prize previously – in 2007 for the Bartimaeus trilogy, so it’s a great honour to be chosen top of the pile again by young readers in Austria. Jonathan attended a star-studded event in central London on Wednesday 2nd July to find out the winners of the Booktrust/Kindle Best Book Award for which The Screaming Staircase was shortlisted. Unfortunately it was not Lockwood’s day, and The Diary of a Wimpy Kid scooped the 9 – 11 year old award. But Jonathan had a fantastic day meeting over 300 children who had voted in the award, the judging adults who chose the shortlist and all the other authors and illustrators up for prizes. The Screaming Staircase WINS the WeRead Prize 2014! In a ceremony held in University College School in Hampstead, London, yesterday, Jonathan Stroud was announced as the winner of the WeRead Prize 2014! Lockwood & Co.: The Screaming Staircase scooped the top prize of this literary award which is in its sixth year and is voted for by students from schools in and around London. It’s co-organised by the wonderful independent bookshop in south London, Tales on Moon Lane, who were in attendance on the ceremony day making sure things ran smoothly and books were available for sale. This prize brings Lockwood’s awards success to 10 shortlistings and 4 wins. Fingers crossed for the Booktrust Best Book Award ceremony next week on 2nd July too. Huge congratulations to Jonathan (and Lockwood, Lucy and George of course)! Jonathan Stroud is delighted to announce he will be one of three judges awarding the Costa Children’s Book Award 2014! Jonathan will adjudicate the award with his co-judges, Lorna Bradbury, reviewer at The Telegraph newspaper and Jake Hope, renowned literary consultant. The winner of the award will be announced in January 2015. Whilst Jonathan was on tour in Germany in the autumn he recorded a filmed interview with Jugend Buch Blog – and the interview has just gone live on the link below. Also interviewed is Judith Hoersch, the actress who travelled the country with Jonathan doing readings in Lucy’s voice. More praise and accolades for Lockwood! It always means a lot when another author writing for young people reviews a book, and this one has got everyone on Team Lockwood smiling. A big thank you to Jo. Also this week we heard that The Screaming Staircase has been included in The Best Children’s Books of the Year, 2014 Edition, in the 12 – 14 years category. The list includes 600 books and is chosen by the Children’s Book Committee at the Bank Street College of Education in New York, US. Committee members consider “literary quality and excellence of presentation as well as the potential emotional impact of the books on young readers” when making their selection. It’s fantastic Lockwood has ticked all these literary boxes to make it in to the list! 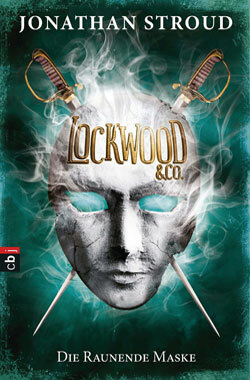 Lockwood gets a new look in the UK! This summer (July) sees the release of The Screaming Staircase in paperback in the UK and across the world. For the UK market, Random House has designed a new look – a striking image of Lockwood himself slightly silhouetted with the moon behind him. This bold new look promises to attract a new sets of fans, and is sure to grab the eye of younger readers too. Here’s the new jackets as modeled by two advance copies which landed on Jonathan’s desk this week. The Screaming Staircase has been nominated for a literary award in Japan – the Sakura Medal 2015. It’s thrilling to see Lockwood shortlisted for awards across the globe – it shows the true international appeal of ghosts and Jonathan’s books! Lockwood scoops Look Hoo’s Reading Award! This weekend, Lockwood & Co.: The Screaming Staircase has won the Look Hoo’s Reading inaugural book award, making it one of the top three winning books on their recommended reading list. Congratulations to all three winning authors! Also, more award news just in: The Screaming Staircase has been shortlisted for the North Carolina Young Adult Book Award (NYCA) 2014. Voted for by students across North Carolina, the winning book will be chosen in March 2015 – good luck Lockwood! MORE HONOURS FOR LOCKWOOD & CO! Lockwood & Co.:The Screaming Staircase has made it on to another highly prestigious list – the ‘CCBC Choices’ - an annual list of the best books of the year chosen by the Cooperative Children’s Book Center in Wisconsin, USA. 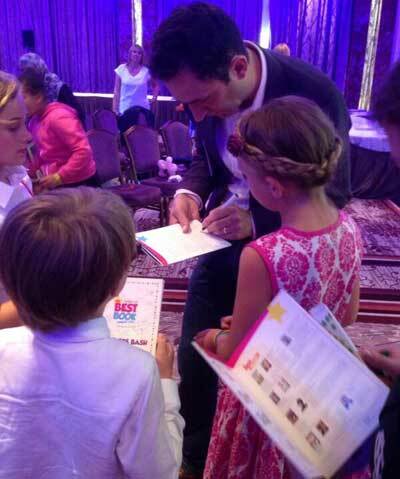 Lockwood US tour: a huge success! Jonathan’s four-week tour of the US is now finished and he’s back at home, resting, recuperating and writing. Announced today, 27th March: Lockwood & Co.: The Screaming Staircase is shortlisted for a Booktrust Best Book Award! This is a major UK literary prize and run in conjunction with Amazon Kindle. It selects only the best books of the year to make the shortlist, so it’s a complete honour to have Lockwood up for the award. The winner will be announced at a ceremony in London in early July. The Screaming Staircase has been shortlisted for the Look! Hoo’s Reading literary award, a brand new prize set up by the people behind the Hoo’s Kids Book Festival (which Jonathan took part in last year). The prize will choose three winning books in early May that will become the Look! Hoo’s Reading recommended reads. Also Lockwood has been shortlisted for an Australian literary award: the Inky Awards are presented by the Centre for Youth Literature at the State Library of Victoria for local and international fiction, and Lockwood is on the list! Watch this space for more award news soon. The award news keeps coming in, and this time it’s for the audio version of The Screaming Staircase. The YALSA has chosen the audio book read by Miranda Raison as an Amazing Audiobook for Young Adults 2014, saying: “…an interpretation that ranges from creepy to hilarious”. Every summer The Reading Agency in London works with thousands of libraries throughout the UK on the Summer Reading Challenge – a scheme designed to encourage kids to use their library in the holidays. For the first time this year a list has been put together recommending books for the 8000 teenage volunteer helpers of the scheme. The teenage volunteers are a vital part of the SRC scheme - they help libraries to run the project, from setting up displays, to helping children choose books; from monitoring stock levels to giving out certificates at the end of the holidays. It’s very thrilling to hear The Screaming Staircase has been selected for ‘The Summer Reading Challenge 2014 Teen Collection’ as it’s been called. Jonathan has worked with libraries during the Summer Reading Challenge for years, it’s a project he passionately supports and he is therefore delighted to have Lockwood on the recommend teen list. Jonathan is once again supporting the Berkhamsted Writing Competition, in aid of the St Francis hospice trust. Jonathan worked with the competition organisers last year to encourage children and grown-ups to write short stories based on a theme, and Jonathan then judged the young people’s category. 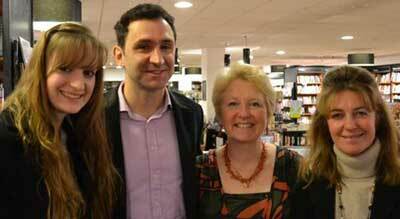 The year the theme for the competition is ‘beginnings’ and it was launched at Waterstone’s Berkhamsted at en evening event with Jonathan, adult-category judge Catherine Alliott and literary consultant Alison Baverstock. Hugely exciting news this week that Lockwood & Co.:The Screaming Staircase has been shortlisted for the L.A. Times Book Award 2013! One of only two finalists in the books for ‘young readers category’, the winner of this prestigious award will be announced at a ceremony in LA in mid-April. Fingers and rapiers crossed everyone! Also exciting news from the digital world – Lockwood has won a Cybils award. Set up and voted for by book bloggers, these awards reflect an appreciation for a book from the online world, and it’s completely thrilling they’ve chosen Lockwood as a winner. Nomination for an Edgar Award! Breaking news – it has just been announced that Lockwood & Co.: The Screaming Staircase is nominated for an Edgar Award, a major literary award in the US celebrating the best mystery writing. The winner will be announced at a ceremony in New York on May 1st 2014. We’ll keep you posted on Lockwood’s chances. A reader review went live on The Guardian website at the very end of last year: “This book is brilliant. I am really looking forward to finding out more about the background of the main characters in book two. This is a book for readers who are looking for originality, humour and excitement with a spooky touch that is not too scary. It’s so exciting to hear Lockwood being nominated for literary awards – to know that young people around the world are reading it and choosing it out as their top read. This month two prizes have nominated The Screaming Staircase for an award - the Northern Ireland Book Award and the ‘We Read’ Award. More details on both prizes below and watch this space for news about shortlistings and, hopefully, some wins down the line! The Financial Times' Christmas round-up also selects Lockwood: "A delicious mixture of bone-dry wit and spooky shocks." "The Screaming Staircase is a magnificent start to a new series... if you are stilling looking for a Christmas present, get your kids this book." Word Candy blog has also recently reviewed The Screaming Staircase: "This is the first book of a series, and it's set the standard very, very high"
Lockwood & Co. The Screaming Staircase has been shortlisted for the 2014 Worcester Teen Book Award. The ghost fighting trio stand amongst good company – also on the shortlist are Anthony Horowitz and Patrick Ness. The winner of the award will be announced in March next year. Jonathan’s adventure in to the world of interactive writing has now come to end – the Lockwood & Co. story Jonathan created for the Guardian for Halloween has now come to an end. Readers around the world helped to creatre the story, suggesting settings, ghosts, titles and jokes to get Jonathan started. Then, over a week-long period in October, Jonathan wrote a chunk of the story every day which was posted on to the Guardian website and readers were asked to decide what happened next. Hugely exciting news this week; The Screaming Staircase has been nominated for the Carnegie medal! This is one of the biggest literary awards in the UK and is chosen by a judging committee made up of some of the best children’s librarians in the country. The nominations are the first round of the award process – now a panel of judging librarians will choose a longlist, then whittle that to a shortlist and from there choose the winning book. The shortlist will be announced in February next year, with the winner chosen in June. 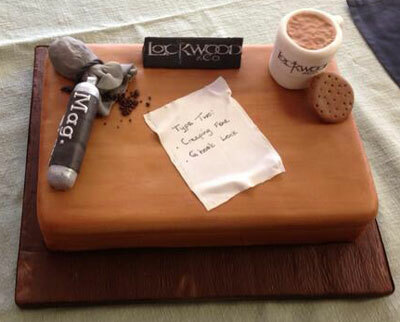 The culinary highlight of Jonathan’s UK promotional tour must be his visit to Droitwich High School where a very talented parent (thank you Kerry Palmer) had made a Lockwood inspired cake, complete with magnesium flare, iron filings and, of course, a cup of tea and biscuit! 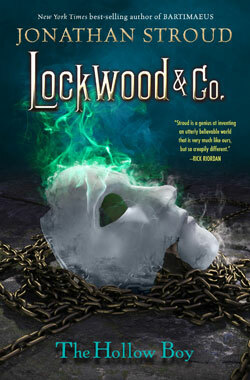 Great to see Lockwood’s made it in to the running for the GoodReads Best Books in 2013 award. Please vote now for our favourite ghost-hunting team! Could you work for Lockwood & Co.? New interactive Lockwood video game launches! Today sees the global launch of a Lockwood interactive video game. Users are put in the shoes of Lucy, Lockwood and George exploring a dark, derelict house with all the typical signs of a haunting. Seen through the eyes of the investigator the game has an immediacy and tension you won’t forget in a hurry. We promise you – it’s very scary! Test your Psychic Sensitivity with this interactive training video for new field operatives. Enter the haunted house with Anthony Lockwood himself, if you dare, and face a strong Type II apparition. Make the right choices to keep the ghost at bay and locate and contain the source. Share with your friends and see who can make it out alive. Second vote for Guardian interactive Halloween story now open! The second vote and chance for you to help create a Lockwood story especially for Halloween is now open on the Guardian website. This time you must choose a title for the story and a funny joke or situation for Jonathan to include. Get your thinking caps (ghost-hunting caps?) on now! The New York Times reviews Lockwood & Co! Lockwood joins up with The Guardian for interactive Halloween story! This week sees the launch of an exciting partnership between Lockwood & Co and The Guardian. Jonathan will be writing a live, interactive story during half-term asking young people to help him create the story. The partnership launches this Friday when Jonathan will be asking kids to come up with ideas for ghosts, settings, jokes and more to include in this exclusive Lockwood adventure. The beginning of the story will go live on Saturday 26th October, and each day of half-term Jonathan will post up a new bit of the story and ask for more suggestions of what happens next. The story will be finished on 31st October, Halloween, and published on the Guardian site in full for everyone to read. “a really well-done and exciting page-turner” say Common Sense Media in their Halloween books round up. Jonathan’s takeover of the Random House UK blog, Totally Random Books, happened for a month in September. Jonathan wrote a weekly article for the blog which inspired much debate and interaction, especially the biscuitometer! More praise and coverage for Lockwood & Co! 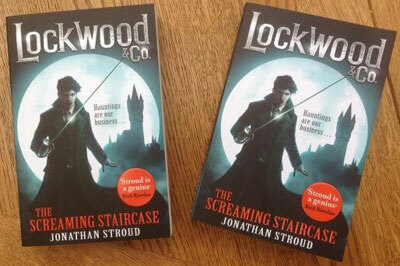 More buzz online and in bookshops this week as the UK edition of Lockwood & Co: The Screaming Staircase gains pace. 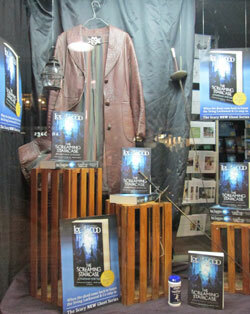 A brilliant independent bookshop in New Zealand, Page & Blackmore in Nelson, has created an amazing window display, pictured right, around Lockwood! Random House Children’s Publishers held a launch party last week in a spooky, haunted pub in central London. The tunnels and vaults below The Old Bank pub are said to be where notorious Daemon Barber of Fleet Street, Sweeney Todd, carried out his atrocities. He was famous for his pies too – hence the party seeing guests served pies, a Lockwood cake complete with spiders and bloody mary cocktails! The packed event was attended by a fantastic mix of the most influential people in UK publishing – literary journalists, book bloggers, booksellers, librarians, teachers, oh, and Jonathan himself of course! Jonathan also brought his family along, who proved useful in a demonstration of ghost-hunting equipment. It was also a pleasure to have some superfans attend the party too – three winners of a facebook competition came along to meet Jonathan and get their books signed. 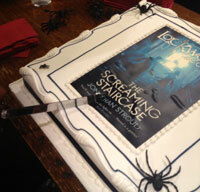 Here’s a summary of the UK blog tour to celebrate publication of Lockwood & Co: The Screaming Staircase. From laugh-out-loud entries to truly insightful revelations, it’s rich reading. Get the kettle on and check out the links below. Top Tips for a Scary Story – Jonathan gives his advice on creating characters, tension and terrifying endings to create brilliant ghost stories. Six Things I Can’t Write Without – from pens to paper, silence to computers, Jonathan gives his essential writing kit and reveals why an uncomfortable chair is a must-have for any author. The Trouble with Covers – find out why Jonathan thinks book jackets are so important and which cover put him off a book for life. Fashion Accessories for Ghost-hunters – the ultimate guide to must-have fashion for ghost hunters. The Write Way – Jonathan answers the vital questions in this Q&A slot. From how he created Lockwood to his favourite recent YA read. My Three Favourite Ghosts – Jonathan describes his three favourite ghosts from literature, legend and history, and uses the phrase “ectoplasmic flesh”! How I Became a Writer – Jonathan looks back at his childhood, student years and early days as an editor in London to unpick how he actually became a writer. Ghost-hunting: Tools of the Trade – so, you’ve set up a psychic detection agency, what kit do you need to get going? Jonathan reveals all. My Favourite Places to Read – a hilarious account of Jonathan’s favourite places to read including in the bath, on a walk and in bed. Location Location – Jonathan describes why he chooses London for the setting of many of books and why he loves a good map. 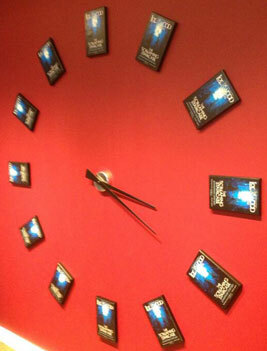 This week’s release of the UK and English language export editions of Lockwood & Co: The Screaming Staircase saw excitement aplenty online, in bookshops and libraries and in the offices of Jonathan’s UK publisher, Random House Children’s Publisher (check out the Lockwood clock they made ‘it’s Lockwood time’!). First off, Jonathan was a guest on Waterstones’ official blog where he introduced Lockwood, discussed literary inspirations and made a confession of his own. For the full review and the really interesting interview see the link below. 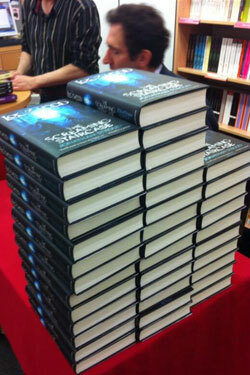 Jonathan tramped the streets of London visiting London bookshops this week to sign copies of Lockwood. What excitements do the next few weeks hold?! UK PUBLICATION DAY IS HERE! Thurs 29th August 2013 is publication day of Lockwood & Co: The Screaming Staircase in the UK, Commonwealth and English langue export market – that means that today fans will be able to buy a copy of Lockwood & Co in English in Britain, Australia, New Zealand and the many countries with English-language bookshops like India, South Africa, Europe and more. To celebrate this exciting day below is a collection of brand new reviews of the book. Watch this space (and Jonathan’s twitter and facebook pages) for photos and news of the first few days with Lockwood, Lucy and George unleashed to the world! This week sees Jonathan doing his first Lockwood events! He’s at the Edinburgh International Book Festival speaking to crowds of school kids and public audiences about his new ghost-hunting series. 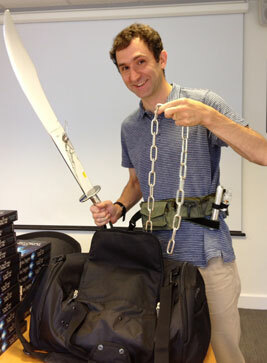 To give you a taste, here is Jonathan modeling some of the props he’ll be using in his talk! The Lockwood coverage keeps coming! Also, an interview: Literatwo was one of the first media outlets to interview Jonathan about Lockwood & Co earlier this year. Based in Germany, the site asked some probing and insightful questions really getting to the heart of Jonathan’s new story. Literatwo has just translated the interview in to English for more fans to enjoy. Read it here. You can even leave a message for Jonathan on the messageboard – go on, drop him a line, he needs some company while he’s writing Lockwood book two! Random House UK is delighted to announced a blog tour to celebrate publication of Lockwood & Co: The Screaming Staircase. Jonathan will be guest-posting articles on some of the very best book blogs in the country. It’s a privilege to work with these bloggers, all of whom are passionate about books, sharing them and shouting about them. The blog tour has already kicked off on the Dark Readers site with a post where Jonathan reveals his five top tips for writing a ghost story. The tour schedule is below – do check out the blogs on the relevant days for more behind-the-scenes info, funny anecdotes and writerly advice from Jonathan. There’s a few more dates to confirm, so watch this space for updates. Lockwood and Co UK trailer is released! Tell Jonathan what you think about the trailer on his facebook site (www.facebook.com/jonathanstroudauthor) or on twitter (@JonathanAStroud). Does it make you want to read the book? Is it scary enough or too scary? Would you want to work for Lockwood & Co? 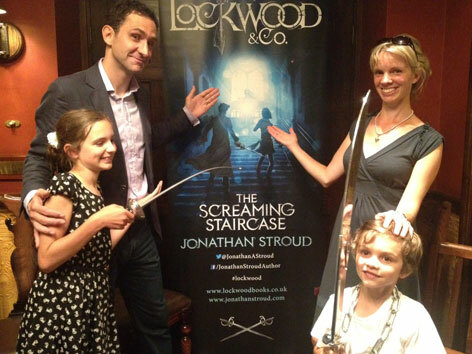 It’s under one month until Lockwood & Co: The Screaming Staircase is unleashed to the world! Jonathan ran a competition on twitter and facebook asking fans to guess how many times the word ‘ghost’ appeared in the book. Twenty fans who guessed closest have won an advance copy of the UK edition to read before anyone else. 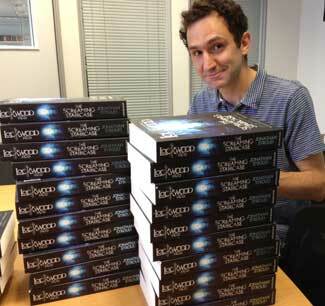 Jonathan also visited his UK publishers, Random House to sign his first copy of The Screaming Staircase. Publishers across the world are eagerly awaiting the autumn release of the first Lockwood & Co book: The Screaming Staircase. Jonathan will be on the road for three months this autumn meeting readers young and old in schools, bookshops, libraries, festivals and more. A number of these international tours are now ready to be announced (see events page for details). Glowing reviews for Lockwood & Co continue! "It's a dark and scary roller-coaster ride that will keep you on the edge of your seats from the very first page to the last. It's gripping, engaging and full of explosive action." "With plentiful wit and good humour, more than a few chilling moments and, above all, refreshing creativity, Jonathan Stroud has constructed an energetic, fast paced narrative that trips nimbly back and forth from the present to the past as he first sketches and then deftly paints this fascinating landscape...it’s a ripper!" The book Rick Riordan says you "need to read"! "Ancient evil, unsolved murders, powerful ghosts and nefarious mortals - this story will keep you reading late into the night, but you'll want to leave the lights on. "Stroud is a genius at inventing an utterly believable world which is very much like ours, but so creepily different. Put The Screaming Staircase on your 'need to read' list!" The jackets for some of the major international editions of the first Lockwood & Co book, The Screaming Staircase, have been revealed. With much buzz on social media, Jonathan Stroud's publishers in the US, the UK and Germany all simultaneously published their jacket images. The US jacket was in fact released in an exclusive deal with online news site, Entertainment Weekly, alongside the first chapter of the book. Click here to view. Let Jonathan know what you think via @JonathanAstroud or via his Facebook page. With just over two months to go until publication of the first Lockwood & Co book, The Screaming Staircase, a sense of excitement and anticipation is definitely growing. There are some amazing marketing plans to make a bang come publication day – look out for digital assets like an choose-your-ending video game, a cinema-style trailer and an interactive storytelling partnership. There'll be blog tours, events tours, virtual talks, twitter chats, competitions, festival appearances, special mailings, coverage in major newspapers, promotions especially for libraries and schools, international trips, and even a bit of fancy dress! Keep checking this site for more news and excitement! First reviews for Lockwood & Co! "A hugely enjoyable fantasy-adventure page-turner"
"A heartily satisfying string of entertaining near-catastrophes, replete with narrow squeaks and spectral howls." 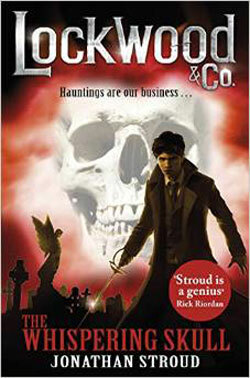 "Best known for the Bartimaeus books, beginning with The Amulet of Samarkand (2003), Stroud writes for a younger audience in book one of the Lockwood & Co. series and delivers some chilling scenes along the way…Stroud made many fans with the Bartimaeus books, and even though this is for a younger audience, his name carries weight with librarians, teachers, and parents." "...another wonderfully entertaining read...Another winning ingredient is the humour – not too much, not too little. This is where Stroud is at his very best, the humour in his books is always perfectly in balance with the storyline, never inappropriate and most impressively, consistently amusing, be it wry, cynical, silly or sarcastic."